Stress can have a terrible impact on us. 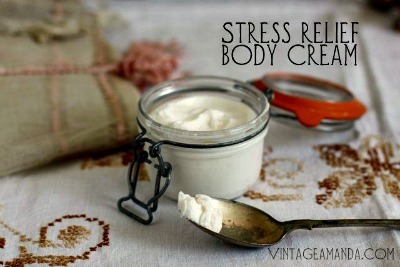 Amanda shares her recipe for a stress relief body cream. This is a wonderfully thick and rich body cream that uses a variety of stress-relieving essential oils. The combination of oils, beeswax, with rosewater and other ingredients whips up to an amazingly thick cream. It’s also an all-natural remedy and includes a complete tutorial. Amanda provides very clear directions and wonderful photographs. Click on the Stress Relief Body Cream – Tutorial link below to see the tutorial and recipe.